These versatile syrups are great to have on hand for adding quick flavor and a hint of sweetness to beverages of all kinds. I sip on unsweetenednaturally flavored waters most of the time; but sometimes I enjoy a little bit of sweetness in my beverages, too. The great thing about these syrups is that you can add a little or lot, depending on how much sweetness you prefer. They’re a great way to wean yourself off of sugary beverages, too, by gradually adding less and less of them. Natural, healthy ingredients. I like making my own syrups so I can control the ingredients and know exactly what is going into them. 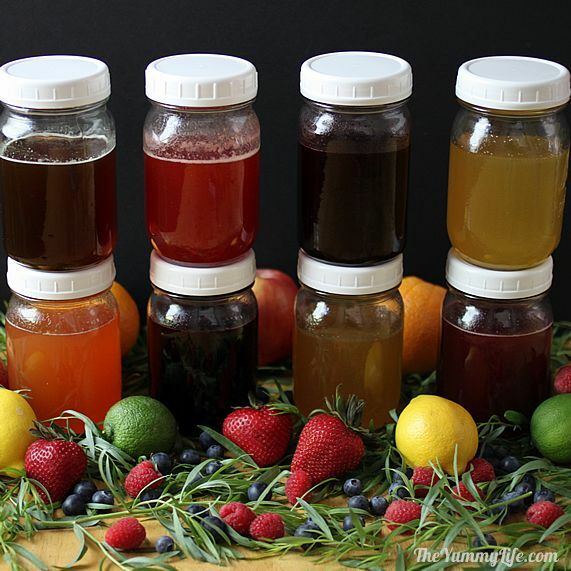 These syrups are nothing but honey, fruit, herbs, and spices. No-cook method retains nutrients. Most of the syrup recipes I come across involve heating and simmering the ingredients for quite awhile. That’s a quick way to extract flavors and make syrup. Trouble is, heat destroys the nutrients in honey, fruit, and herbs. I’ve found that taking an extra day to let raw ingredients marinate in the fridge results in fresh flavorful syrups with all of the nutrients left intact. This no-cook method is healthier and easier, but you have to be patient and wait 24 hours before you can use them. That inconvenience is well worth it to me.